Team Scary Potter and the Hauntwarts Express reviewed this Haunted Attraction on October 7, 2018. Let’s face it, most “family-friendly” haunted attractions operate with a pretty distinct misnomer : they’re not for “families”, they’re for children. This presents Halloween-enthusiast forebears with a depressing dilemma : fun for me or fun for the kids? That’s a sad Sophie’s Choice that no parent should need to shoulder. What, then, if I told you that it WAS possible to satisfy both the mature and knee-high members of the family with a single haunted attraction? Part theatrical-level haunted walk through and part narratively-driven adventure-game, Castle Blood is perfect for both children and adults alike. No need to worry about gory set design or obnoxious chainsaws – Castle Blood doesn’t need them. What it does have is a wonderfully-colorful cast of snarky vampiric hosts waiting to entertain (and spook) incoming patrons this Halloween season! Given Castle Bloods’ nature as a fully-interactive story-based game-adventure, the majority of the entertaining leg-work belongs to the cast, and they were very successful at maintaining a realistic, cohesive fantasy narrative. Though their numbers were short (little more than a dozen interactive actors and another half’s worth in boo-scarers), their personalities were huge, so we didn’t feel ill-attended at any point. Spending several minutes which each character gave us a greater sampling of their acting prowess than we would normally experience at a “pass-through” attraction. Truthfully, unlike our last visit, there weren’t any wildly lackluster performances this time. The nameless scientist and his tweaking assistant, Zap, were an entertaining duo, even if the former may have been a little too eager to gamble our well-fare for the greater good. Wisp and waft, a much more somber and morose pair were both excellent as well, timing their interplay perfectly. Atonlio and Morpheus were also both incredibly memorable, the former as one of the only straight-forward-altruistic Bloodians toward us, and the latter for his soft-spoken trickery and good humor. Our team-howl with the handsome werewolf was a highlight of our evening. Sometimes lycanthropes get lonely too. Madam Spider may have seemed a twinge BOSSY, but what does one expect from a woman who spends all day caring for thousands of screaming infants? She, too, had unofficially-aligned herself with Team Potter by the end of our exchange; she had that certain twinkle in her eyes…all of them – you know what I’m saying? In all seriousness, extra props to Ms. Spider who had just joined the production THE DAY we visited and still put forth a great performance. I said it, see??? We’re cool now, right? So… maybe don’t eat me? We were very impressed by the spectrum of characters that we encountered, many of their off-script ad libbing abilities, and the amount of good-spirited snide laughs they invoked… mostly at my expense. There was a pretty broad selection of characters involved in the tour this year, so a spectrum of different costumes were on display. Every member of the core cast was well-attired, primarily in different elaborate, Gothic wardrobe pieces. We didn’t note any obvious apparel-slouchers among the interactive actors. Make-up was largely kept to accentuation levels considering the near-human visages of the Bloodites, and worked well to enhance their specific personas. We most enjoyed the very unique garb that Madame Spider was situated in, an appropriately oct-appendaged apparatus, though our werewolf friend (the only true full-body costume in use) appeared snazzy as well. The haunters (which are a distinctly-different breed at Castle Blood) were probably not as elegantly-attired, but they were too hidden to really be noticed. Finding the Castle was easy enough using GPS navigating, and its accompanying parking lot is directly behind it. There weren’t any parking spotters, but the location was lit well-enough and free. Everyone likes free. Several bathrooms are available alongside the line que as well. Speaking of the que, the Castle’s roving ukulele-toutin’ bard is back, and solemn-but-friendly Boris patrolled the crowd, interacting with guests. Additionally, two different gentleman vampires amused patrons as they also controlled the line-flow. All four gentlemen were excellent and particularly friendly for undead blood-suckers! “Castle Blood feels like a Gothic monolith removed from a Hammer Films-infused, altered reality and relocated to a random city block of Anytown, USA. In a perfect world, the castle would occupy a darkened hillside, enshrouded in perpetual mist. There’d be a foreboding forest, timely lightning cracks – the whole works. With our imperfect reality, however, the castle stands at odds against its surroundings – a defiant embodiment of the eternal Halloween spirit holding back the surge of urban sprawl. All city-based haunted attractions face similar battles, but the clash felt even more prolific at Castle Blood. Perhaps Castle Blood will find its true home atop that misty hilltop some day, but for now, like every other hardworking post-human, you work with what you have. They were kind enough to include a Nox Arcana soundtrack in the que line, for which I am certainly grateful. Seemingly every inch of The Castle is adorned with multitudes of weaponry, animal taxidermy, books, relics, mystical antiquities – you name it. If it could reasonably be found in a classic horror film or novel, it’s on a shelf in the castle somewhere… perhaps in multiples! It became difficult to truly appreciate all that there was to see, but we certainly tried our bests! Several of the outdoor segments stood out as well – the graveyard, filled with MONUMENTS (thank you for providing the distinction, moderately-creepy tour guide! ), mausoleums and all the fixin’s. Additionally, the Crowhaven location and its adjoining spider lair looked excellent as well. While the indoor locations had the reasonable appearance of centuries of inhabitation by pack-ratty vampires, these external realms had more natural, open aesthetics. There were a few notable soundtracked portions of our journey, but the most frequent aural overlays belonged to the plethora of animated startles and scenic accoutrements that we passed. Some subtle, many overt, others simply noisy, we never seemed able to pass a single hallway, or exit a chamber without some form of electronic guardian reminding us that we were intruders in a dangerous location. Also, there wasn’t a laser swamp. I love you, my haunted brothers and sisters across the industry but, please, can we just let it go? Some haunts have begun incorporating game-like elements into their attractions, and of course there have always been various forms of spooky theater. Castle Blood’s premise is a slick marriage of these two components, positioning them as the framework for a haunted attraction, and the union works very well. The ostensible impetus for a customer’s journey through the Castle usually begins as a benign tour through the clan’s home (at least as benign as a romp through the dwelling of a coven of vampires can be), but a deeper, underlying narrative quickly begins to unravel shortly into the journey. This season’s adventure, titled Conundrum, seemed to focus on duality, and the understanding that both sides or solutions to a problem can contain valuable insight… give or take. The Bloodians explain it better and the moral unfolds throughout the dozen or so challenges of the evening. Our group progressed along, stopping for several minutes to conduct business with a different resident of the Castle, becoming involved in a brief intellectually-evaluative foray and then moving to another station. We collected various artifacts (the acquisition of talismans is the primary order of business this year), made some trades, and solved puzzles until we had achieved our goal by the end of the journey. Our eventual victory was made even more fulfilling with the knowledge that we actually could have “lost” along the way by making poor choices or failing to decipher the clever word-play at the heart of many of the puzzles. 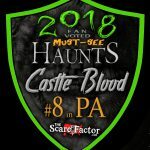 It’s no secret that we love haunted attractions that attempt to offer more than standard startle-scares and pretty set craftsmanship and Castle Blood’s conceptual uniqueness was much-appreciated. To be blunt, Castle Blood was not very scary. Fortunately, they weren’t trying to be – and that’s not some reviewer’s participation trophy, softening of the hard truth – it’s just not what they set out to be. They are spooky; the Castle maintains a solidly eerie ambiance, and they are ABSOLUTELY entertaining. But scary? Very little. They did offer perhaps a half-dozen pop-out-of-nowhere wall-scarers, and, as stated in the Effects category, a small fleet of animatronic miscreants, but that was largely where the direct scare attempts ended. Several of the interactive scenes were definitely ominous or even a bit chilling – we didn’t REALLY know what was going to expect when we were choosing between boxes or skulls – and the best example of this was the gypsy’s room. “Close your eyes and hold out your hand” has ended poorly for many overly-trusting wanderers, believe me. Also, when the rest of my group was asked, “Ok, now who is going to protect him?” the situation began to feel much more alarming immediately. As I’ve said before, if a patron is searching solely for easy startles and extreme scares, realistically, this is not your attraction. 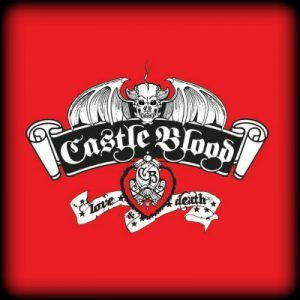 General admission tickets to Castle Blood are 20 dollars, while VIP tickets are 25 (the latter is available online only). The Castle hosts lights-on matinee shows for $8 as well. Our adventure through Castle Blood lasted a full fifty minutes, placing our minutes of entertainment per dollar spent at a very robust 2.5 ratio. As mentioned previously, Castle Blood is a different breed of haunted attraction – chainsaws and dripping entrails be damned. Extreme gore seekers, this is not the haunt you’re looking for. To everyone else though, especially fans of wry humor and narrative, interactive fun, Castle Blood’s puzzle-heavy, Gothic variety act is an excellent choice for a Halloween evening. 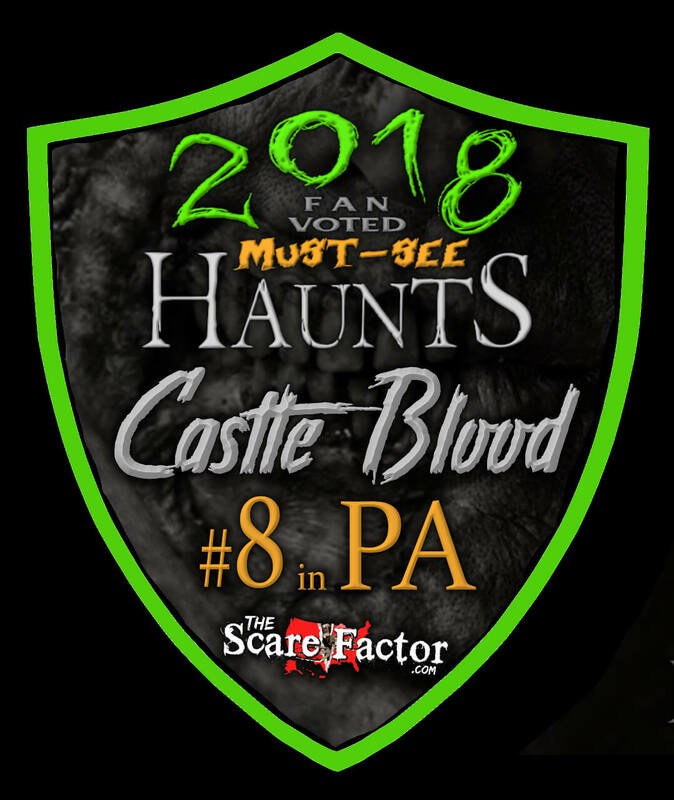 Admittedly, our review scoring system is a good-bit biased against haunt-lite attractions (arguably with good reason), so understand : Castle Blood’s entertainment-punch packs a much mightier wallop than our numerical-appraisal may lead you to believe, and this season’s challenges and story were even better than our previous visit to the Castle. Because of this, we highly recommend a visit to Castle Blood this season. Just be sure to use proper form when bowing before the spider queen. She hates revolutionaries.